About a year ago, Microsoft released Windows 8 to much hype. The Redmond-based company basically said touch was everything and the only thing to think about. But most of Windows users are still on non-touch laptops and desktops so Microsoft tried to integrate the keyboard-mouse experience into Windows 8. Most reviews had said that the company had failed and that the traditional interactions are awkward clumsy. As a result, I didn’t upgrade — until now. After a series of partition-merging, hard disk-crashing events, which is an interesting story on its own, I had fresh hard disk to start from scratch. I decided give Windows 8 a shot. This is my take on Microsoft’s modern user interface. As soon as you startup Windows 8, the interface looks much, much cleaner. Microsoft is known for its sharp-edged corners and there isn't a single rounded corner on sight. I don't find it annoying or anything but you might think otherwise. I like the lack of extreme gradients, making it easy to focus on the content instead of how the application looks. As the saying goes — Good Design is Invisible. It won't take long for you to understand that Windows 8 is heavily biased towards the new, modern apps. Almost all the default apps inherent the new look and opens up in immersive full screen. The most obnoxious default app — to me — was the new calculator which takes up all the screen space for doing some simple calculation. If you feel the same you can use the old calculator which has been included out-of-the-box with Windows 8. Other than that, the new apps are pretty good. I especially dig the Music app (Xbox Music) which does some clever wizardry to download unprovided album art and other information. In the end of the day, the app feels much more premium and polished to use when everything looks so nice. Software not optimized for the new look runs on the traditional desktop which, by the way, acts like just another app. The whole story with Windows 8 is the Start menu, a tiled grid, each representing an app. When done right the Start menu is invaluable, giving you useful information at one central place. Those apps of course have to be configured to support the live tile functionality which many apps lack still. But those who have it are pretty good. For example, The email app (which works with my @erubai.com email address) gives me notification for new email; the weather app shows me the weather alongside a beautiful background image; the Flipboard app tells me what is happening in the world and the Skype app tells me about missed messages which absolutely awesome because I use Skype as my primary method of communication with my peers. The Windows 8 experience can be summed up into one word — FAST! The team has done an absolutely great job making stuff feel instantaneous and fluid. On average my boot times has been around 4-5 seconds and that’s on a normal, spinning hard drive. You can expect speed to decrease on a solid state drive. I am not sure if app themselves load faster but it sure does feel so. For example, in Windows 7 I had to wait a couple of seconds before Chrome launched and now, as soon as I click the Chrome tile, the browser wakes up waiting for my command. The only complaint that I have with performance is that the Pictures app is kind of slow even though I don't have a single picture on my hard drive that it needs to load. Windows 8 also has this auto-booting up problem that makes it incredibly creepy. The other day, I had shutdown the computer and went to get a glass of water. Upon returning I saw the computer boot up, login to my account and then open up Chrome — all automatically! If you happen to know what the problem might be, let me know. One of the best things about Windows 8 is how tightly integrated OneDrive (Formerly SkyDrive) is. Anything and Everything has the option to be synced and backed up by OneDrive. You get 15GB of space with a free account so you should definitely backup all your stuff. Windows 8 has been great so far and I hope that doesn't change. The key to using Windows 8 — in my opinion — is to give live tiles and the default applications a fair shot. I have seen too many times that people switching to Windows 8 and using it like Windows 7. There is nothing wrong with that but does not make for a good user experience. When using Windows 8, try to use Reader for reading PDF; the default Music app for listening to Music; the Facebook app for Facebooking and the Twitter app for Tweeting. 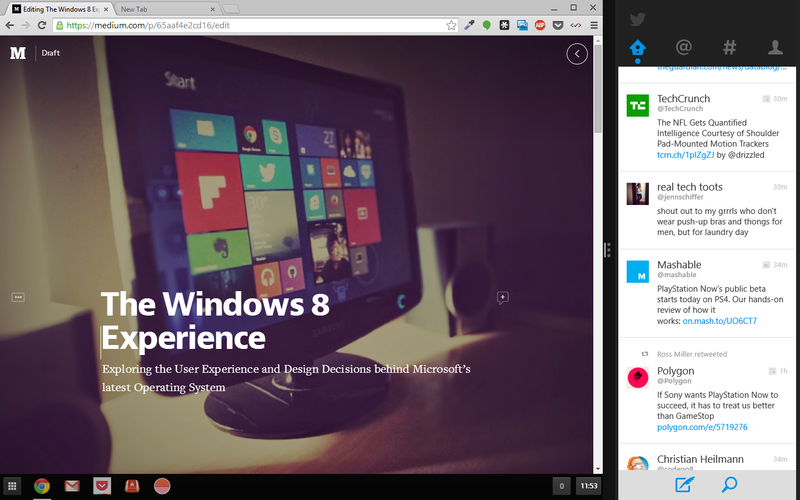 2 weeks in, I definitely prefer Windows 8 over 7. Deep Thoughts & Infinite Loops.